Since Quibids is the largest penny auction site in the USA we often find people searching for the differences between quibids and ebay. This article will take a look at how these two auction sites are completely different and are totally different types of shopping experiences that both use the name ‘auction’. Be forewarned, if you are under the impression that Quibids and eBay are similar then consider yourself wise for searching for this article comparing Quibids and ebay! Even though they are both considered auction houses, there are night and day differences between a penny bidding site like Quibids and a traditional auction like eBay. Here are how eBay & Quibids are similar. The similarities pretty much end there between ebay.com and Qui bids! Quibids is a penny auction site using a pay to bid model business model and ebay is not. It is free to bid on ebay and only required to pay if you win. It costs money to bid on quibids. The biggest difference between Quibids.com and Ebay is that quibids.com is a penny auction site and Ebay is not. In a nutshell Penny Auction Sites like quibids.com use a pay-to-bid model where you have to purchase bids and use them trying to win auctions. You can spend money on quibids and not walk away with any items. 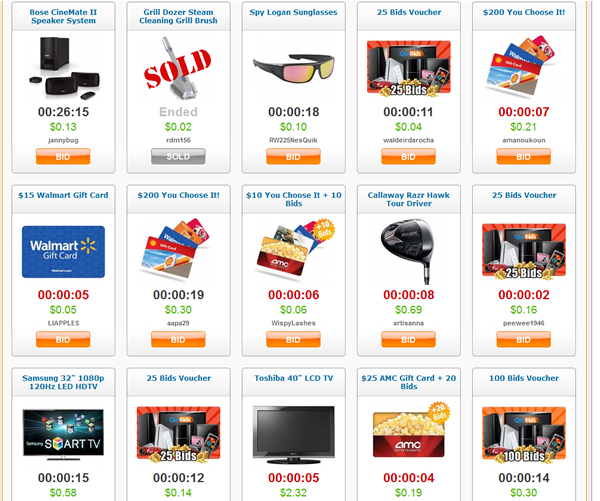 As far as penny auction sites go, Quibids.com is one of the sites that is most like ebay.com in that your risk can be lessened to reasonable ‘buy it now’ prices on all auctions. Quibids.com is one of the few penny auction sites that is large enough to offer a really attractive buy it now program that allows bidders to apply 100% of the money spent on used bids trying to win an auction off of the buy it now price from quibids. Be warned, you only have two hours after the completion of the auction to exercise your right to buy it now so do not delay and plan accordingly if you are not at the computer during the time you use your auto bidder! Remember, penny auctions are a game. A competitive game where you can win incredible deals or lose money. If you are ready to take the plunge then Quibids.com is one of the safest choices for you to consider if you are wanting to minimize your risk while trying to win an incredible deal! Posted in Blog, Penny Auction News and tagged quibids.com. Bookmark the permalink. Here’s a stupid qutesion if I download a VM like boot camp on my Mac, do I have to also download windows OS so bidfellow can work? or can I just download the VM and bidfellow on the Mac? Just asking because I’m not sure how VMs work. Any assistance you provide in this matter will be greatly appreciated, thanks!